Human rights activist, journalist and former Khordad newspaper writer, Farshad Aswad was arrested late last week as he was leaving the country for Malaysia. According to Jaras sources Aswad had voiced concern about the possibility of being arrested the night before his scheduled departure from the country. Farshad Aswad is a relative of Reza Khandan, the husband of incarcerated HR attorney Nasrin Sotoudeh. Aswad was in the process of making a documentary about Sotoudeh and had voiced concern that this might cause his arrest. According to Jaras sources, his family has had no news from him since his arrival at the airport. Aswad was also imprisoned after the disputed presidential election of 2009. Incarcerated blogger and human rights activist Hossein Ronaghi Maleki has written a letter to Ayatollah Khamenei, the Supreme Leader of the Islamic Republic of Iran, announcing the launch of his hunger strike. According to Hossein’s latest CT Scan, his left kidney is non-functioning and must be removed and his right kidney is also not functioning properly and if surgery is not performed immediately, he will lose his the functionality of his right kidney also. Despite the recommendations by physicians that Hossein needed treatment and recovery outside of Evin prison, the IRGC Intelligence continues to deny a medical furlough for him. Those who listen to the word (good and just), then follow the best of it, those are they whom God has guided, and those are the men of understanding. “I am a supporter of just actions, I say we should be fair, let us look at the actions, this has nothing to do with the election, it is about just and unjust. Supporting those who serve the country is not only my duty but is everyone’s duty. I support and welcome all good deeds, good actions, good progress, those who serve the people, those who help and offer compassion towards the needy, those who stand against injustice and tyranny. Surely no fair-minded person could disagree with this statement, but against the guidelines of your viewpoints, I, Hossein Ronaghi Maleki and the other political prisoners, and even the leaders of the Green Movement, Mr. Mir Hossein Mousavi, Hojatol Islam Mehdi Karoubi and Mrs. Zahra Rahnavard, have been imprisoned and have suffered tortures for seeking freedom, justice and for standing against oppression and despotism and for our concern for the future of Iran. Alas, not that no one offered us any gratitude, but much ingratitude was offered to us. The reality is that most of us have not acted outside of these guidelines. Even beyond that, many of us believed that what we have done are beyond and above our national duty, moral and religious duty. But unfortunately, what we witness in Iran today, is nothing but despotism, lawlessness and oppression against those who love Iran and freedom and those who stand up for their rights. Those who took a stance of good will and protested the existing unjust situation. Security and intelligence apparatuses such as Sepah’s Intelligence and the Intelligence Ministry are under the impression that they can force us to surrender to their illegitimate demands by threats, arrests and by intruding on the privacy of our homes. Against religion and against the law, these security apparatuses, attacked defenseless protesters, mercilessly beat them, injured hundreds of them, arrested thousands, martyred tens of them, arrested and imprisoned political activists, civil activists, critics and dissidents. They imposed naked and overt censorship on all the Iranian press. With total control over Seda and Sima (National Radio and TV) and all other pro government media, distorted the facts and published outright lies. They know very well how to create psychological and mental dilemma for the dissidents and the critics with various torture methods. So much so, that now even the Bureau of Prisons is complaining about the arbitrary actions of these security apparatuses. We must admit that judicial independence is not possible with the existence of so many intelligence and security entities. We must admit that the society is facing a great explosion, and the current superficial peace is basically due to oppression, intimidation, imprisonments and suppression. We must know that the thoughts of freedom seekers can not be enchained! Ideologies can not be tortured! Truth can not be suppressed! We must accept that confronting the people of this land is day by day becoming more inhumane and unbridled. It knows no boundaries and limitations. Every critical act, every critical word is confronted with repression and arrest. We must see and hear and, like Ayatollah Khomeini, validate the fact that, “Some of the Pasdaran (The Revolutionary Guards), in parts of the country, over step the boundaries of their statutory mission, and unduly interfere in matters of courts or other institutions. Just as you became disturbed over the Tehran University dormitory and Kahrizak detention center events, and ordered an investigation, I hope that you at least pay attention to my dire situation, status of the political prisoners, our families, the illegal detention centers, and the manner of their conduct. I protest these illegal practices by launching a hunger strike as of May 26, 2012 and protecting my life is the responsibility of the officials of the Islamic Republic. – To restore the rights of political prisoners and their families (rights such as, use of furlough, use of telephone and visitation right and etc.). I am of the belief, every human being’s silence against oppression and injustice is a betrayal of the innocent blood of the martyrs of this land. I believe that my blood is not any bluer than the blood of the likes of Neda and Sohrab and neither is the suffering of my parents above the suffering of their parents. We all know that these institutions exploited the decency and tolerance of the political prisoners. This time, with patience, I will stand by this action, and perhaps I may find my place beside the late Hoda Saber who lost his life in prison. Protesting lack of proper medical treatment and denial of medical furlough, Imprisoned blogger and HR activist Hossein Ronaghi Maleki has started a hunger strike. According to reports by the Human Rights Activists News Agency, in a phone conversation with his family yesterday, Hossein informed them of his hunger strike. He launched this hunger strike despite his dire heath. According to the radiologists who read Hossein’s latest CT Scan of his kidneys, the left kidney is non-functioning and must be removed. According to doctors who have studied this CT Scan, Hossein’s right kidney is also not functioning properly and if surgery is not performed immediately, he will lose his right kidney also. Previously, Hossein Ronaghi had said due to earlier failed Pyeloplasty surgeries he is in need of additional surgery. Delay in surgery will cause him to lose both his kidneys and will result in both kidneys being removed. It should be noted that to reduce pain, Hossein is being injected on a daily bases with painkillers and with morphine which has caused him to develop gallstones. Hossein Ronaghi Maleki, one of the Managing Directors of Iran Proxy, was sentenced to 15 years in prison by the Revolutionary Court. He has been in prison since December of 2009. Under increased heavy security atmosphere in East and West Azarbaijan, tens of people were arrested by police and Intelligence Ministry in the last two days. Yesterday in Tabriz, during scattered demonstrations protesting drying up of Lake Uromieh, Esrafil Omidi a post graduate student at Shahid Beheshti university in Uromieh and activists Mostafa Avazpour and Ghader Norouzi were arrested. Also yesterday morning, former secretary of the Azerbaijani Association of Tabriz University, Afsaneh Toughi was arrested inside the university by Intelligence Ministry forces. Akbar Mohajeri, Hassan Mirzakhani and Mohamad Eskandarzadeh were among those arrested in Tabriz yesterday. Their detention location is still unknown. Security forces arrested the majority of these people by going to their homes without a warrant, performing a search of the home and confiscating personal belongings. In another large city in Azarbaijan (Uromieh), university students Askar Khanyari, Hamid Nofouzi, Mehrdad Raha, Roholah Khani and IRGC soldier Mehran Keshavarz were arrested. Also, on May 20, city of Maragheh political activist Hoosein Ahmadian and Tabriz Bazar businessman Ali Aghazadeh were arrested. In the wake of continued denial of medical furlough, Hossein Ronaghi Maleki’s health has deteriorated and is in critical condition. Previously, Ronaghi’s surgeon had indicated that, due to earlier failed Pyeloplasty surgeries he is in need of additional surgery. Delay in surgery will cause him to lose both his kidneys. His kidneys were damaged by blows received during interrogation sessions which resulted in under going 4 different Pyeloplasty surgeries. He was returned to prison prior to complete recovery from the surgeries, and suffered kidney infection and bleeding after each surgery. Despite the recommendations of the Medical Examiner’s doctors, his surgeons at Hasheminejad hospital and the doctors at Evin’s medical clinic that Hossein needed treatment and recovery outside of Evin prison after each surgery, the IRGC Intelligence continues to deny a medical furlough for him. A three and half years imprisonment and seventy lashes sentence was upheld for electrical engineering student at Ferdowsi University of Mashhad, Mohamad Ghaffarian. According to reports by the Human Rights Activists News Agency, the sentence of three and years in prison plus seventy lashes issued by a lower court and upheld by the Court of Appeals has been delivered to Mohamad Ghaffarian. He was sentenced to one year in prison for insulting the Supreme Leader, two years in prison for anti-national security acts, six months in prison plus 35 lashes for disturbing the public order and 35 lashes for insulting the president. This sentence was issued, even though he was only charged with anti-national security acts at the time of arrest and interrogations. The charge of insulting the president was not even mentioned during his trial. Ghaffarian has twenty days from the date the sentence was delivered to appeal his sentence. Previously, Ghaffarian was arrested during a protest on February 20, 2010 and was incarcerated for about one month. Despite receiving a rank of 206 on the masters degree entrance exam, he was rejected for Masters degree studies and was suspended from continuing his education. On Tuesday May 15, four Baha’is were arrested in Najafabad. According to reports received by the Human Rights Activists News Agency, six Intelligence Ministry agents from Najafabad (a suburb of Esfahan) entered the home of a Baha’i with a warrant and, after a search of the home and a brief interrogation of the people present, they arrested four Baha’is. Bahram Ferdowdian, Mana Pirali, Sholeh Afshari and Azam Tabibi were the Baha’is arrested. The agents also arrested a Moslem man along with his wife and two children that were in the home. 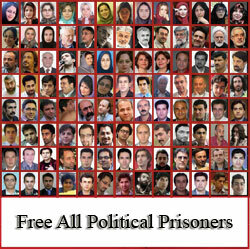 All the people arrested were taken to Dastgerd prison in Esfahan. During the search of the home, another Baha’i named Arash Haghighi arrived at the home, the agents asked him to sign the list of items being confiscated and after he refused they physically assaulted and beat him. Political prisoner Mohamad Reza Motamednia, incarcerated in Ward 350 of Evin prison was taken to hospital last night on his 40th day of hunger strike. But the security agents did not allow his son to even have a few minutes to tell his father about Mir Hossein Mousavi’s request for Motamednia to halt his hunger strike. According to reports by Kalameh, despite the fact that Motamednia had specified previously that he will only halt his hunger strike if requested by Mousavi, the security agents prevented his son from giving him Mousavi’s message. Motamednia continues to be on a hunger strike despite his dire health . Motamednia’s health became dire last night and he was taken to Taleghani hospital. Kalameh reported Wednesday that, as soon as Mousavi became aware of Motamednia’s hunger strike, he requested for him to halt his hunger strike. According to this report, security agents accompanied Mir Hossein Mousavi and his wife Zahra Rahnavard to visit with Zahra Rahnavard’s mother, Mrs. Navab Safavi. During this visit, one of Mousavi’s relatives informed him of Motamednia’s hunger strike protesting incarceration of the Green Movement leaders. On day 41 of his hunger strike, Motamednia has lost more than 66 lbs, and suffers from severe tremors and an irregular heartbeat, all causing much concern and worry for his family and friends. This 62 year old political prisoner was special adviser to Bahonar, Rejaei and Mousavi during the Iran-Iraq war, and was responsible for providing support to the Commander in Chief during that war. He launched a hunger strike on April 9, 2012 to protest injustices committed by the government and in particular the house arrest of Mousavi, Karroubi and Rahnavard. Since that date, Motamednia has remained on hunger strike. During this period, he was incarcerated in solitary confinement at Ward 240 of Evin prison for 20 days. Despite requests by many political activists, including Mousavi’s daughters, that he halt his hunger strike, Motamednia, thanking them all, said that he will remain on hunger strike until either the Green leaders are removed from house arrest or he receives a direct request from Mousavi himself to end his hunger strike. Now one of his conditions has been realized. During a visit with his family, Mousavi was informed of Mohamednia’s condition, and asked Mohamednia to halt his hunger strike. But, not only did the prison officials and the authorities not relay Mousavi’s message to him, but they did not even allow Mohamednia’s son to convey Mousavi’s message to him in the hospital. According to reports by Kalameh, on Monday May 14th, incarcerated blogger Hossein Ronaghi Maleki was transferred to Hasheminejad hospital in dire health. After examinations by doctors, they said if he continues to be incarcerated in prison and surgery is not performed immediately, he is in danger of losing his kidneys. Previously, Ronaghi’s surgeon had indicated that, due to previous failed Pyeloplasty surgeries he is in need of additional surgery. In his recent examinations of Hossein, the surgeon stressed that delay of additional surgery will result in failure of Hossein’s kidneys and they will have to be removed. Zolaikha Mousavi, the mother of this imprisoned blogger, also said, “We are worried for Hossein. Previously they threatened me with my and my daughters’ arrest if we do press interviews. Believe me, lawlessness and injustice have put a black cloud over our lives. Blogger and human rights activist Sayad Hossein Ronaghi Maleki was arrested by Sepah (IRGC) during the post-presidential election events in 2009. He was tried in Branch 26 of the Revolutionary Court, presided by Judge Pirabbasi, and was sentenced to 15 years in prison. Despite the recommendations of the Medical Examiner’s doctors, his surgeons at Hasheminejad hospital and the doctors at Evin’s medical clinic that Hossein needed treatment and recovery outside of Evin prison after each surgery, but the IRGC Intelligence continue to deny a medical furlough for him. After fifteen months in temporary detention, University of Texas post-doctoral student in nuclear physics, Omid Kokabee was sentenced to ten years in prison on charges of cooperation with an enemy state, by Judge Salavati in a show trial labeled “Trial of those accused of cooperation with Mossad in Israel”. On Sunday May 13, trial was held for 15 defendants charged with espionage in the court room of Judge Salavati. This trial was reported and covered in the pro government media, including Seda va Sima (TV) as the trial of Israeli spies. Eight of these defendants were imprisoned for months prior to this trial. In the courtroom, some of the defendants accepted their charges and even thanked the Intelligence Ministry for arresting them. But Omid Kokabee refused to say anything in court, therefore was sentenced to 10 years in prison. After receiving his Bachelor’s degree from Sharif University in Tehran, Omid Kokabee went to Europe and the United States for further education where he obtained a post-doctoral degree in nuclear physics from University of Texas in the U.S. In recent years, he had been approached a number of times by Iran’s nuclear program and by universities affiliated with IRGC to cooperate and work with them but he had always refused their offer. During his incarceration and interrogations they tried to force him to cooperate and work with them by putting pressure on him and his family but Kokabee refused and said it would always be an honor to serve his country through academic activities but has no interest in working on military projects. During his fifteen months of incarceration, many domestic and foreign scientific organizations and scientists voiced their support for this 30 year old scientist and had asked for his release from prison. Included in this group were a number of Nobel Physics Prize winners who wrote a letter to Ayatollah Khamenei asking for the release of Kokabee. Also among them were international science Olympiads and winners of dozens of scientific societies including the Society of the IEEE. Ahmed Shaheed, the UN Special Rapporteur on the Situation of Human Rights in Iran also voiced concern about Omid Kokabi’s situation in his report.